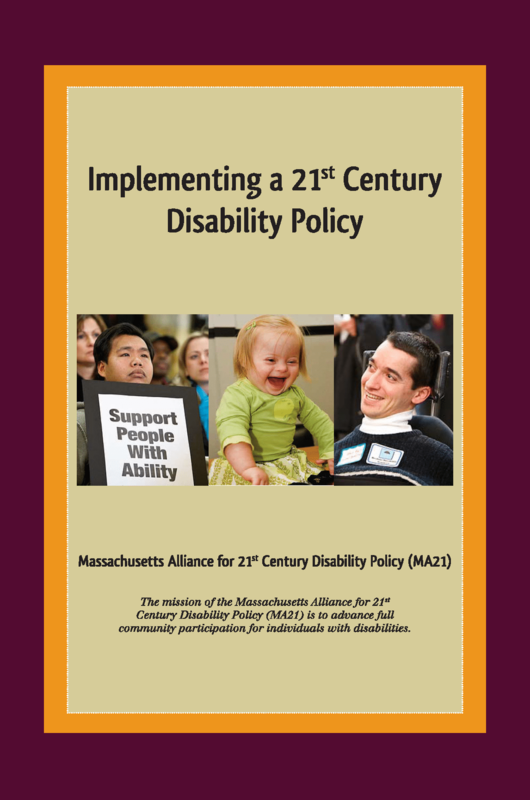 The mission of the Massachusetts Alliance for 21st Century Disability Policy (MA21) is to advance full community participation for individuals with disabilities. We hope and expect that many advocacy organizations and providers will embrace this document as well, creating consensus on a unified framework through which to view and improve public policy for individuals with disabilities and their families. What is the goal of MA21? Improving Disability Policy in the state of Massachusetts provides supports and services which creates a real and meaningful life for individuals with disabilities. It was created by The Massachusetts Alliance for 21st Century Disability Policy (MA21) as a collaborative effort with many participants. It is intended for families and individuals, elected officials and other policymakers, and others such as teachers, social service providers and healthcare professionals, to help them conceptualize what a comprehensive disability policy can and should look like.